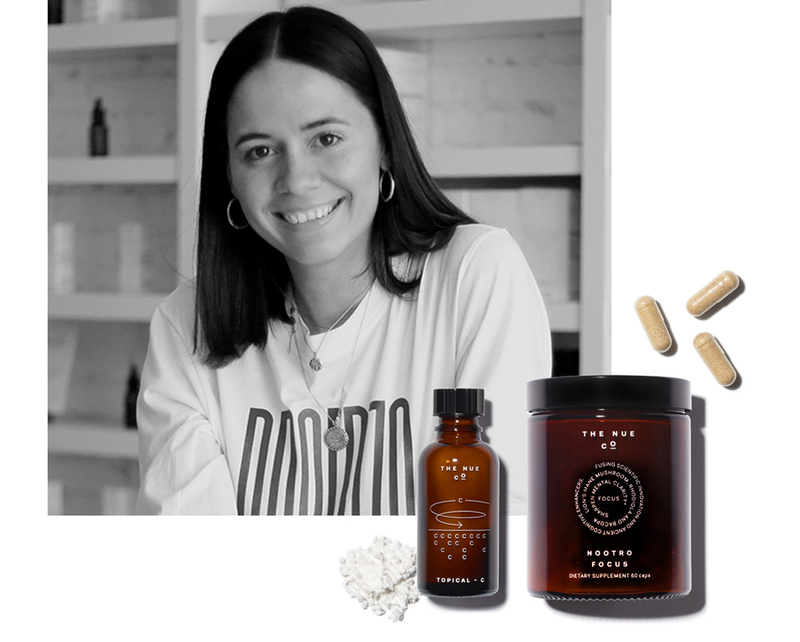 The Nue Co. founder is taking on stress, mental clarity, and sleep with a reimagined class of supplements. In this series, VIOLET GREY profiles female beauty entrepreneurs who are considered industry game changers for their individual approach to business. Each one entered the conversation in her own manner and maintained a steady, if not unparalleled, trajectory with her indomitable spirit. Here, we talk to Jules Miller, the Brooklyn-based Brit and founder of new wave supplement brand, The Nue Co.
Before launching The Nue Co., Jules Miller thought a lot about what was wrong with the bustling supplement market. “Why do they have to be such huge, hard-to-swallow capsules?” she asks. “Why do these products have to look so awful? Why do they have unpronounceable ingredients that I would never eat in a million years?” Not only did those questions come from vast amounts of research (her grandfather was a pharmacist), they also stemmed from Miller’s struggle with irritable bowel syndrome, a gut disorder characterized by cramps, bloating, and bouts of digestive issues. Fast forward to 2017, Miller launched The Nue Co. with their signature Prebiotic + Probiotic blend, specifically crafted for those who suffer from IBS. Rather than use live bacteria (which usually dies in transit and digestion, explains Miller), The Nue Co.’s formula is a spore-based complex that's highly resistant to stomach acid and activated in the small intestine. Naturally, the brand evolved and now has 15 products including Sleep Drops, Topical C (a stable vitamin C powder for your skin), and Nootro-focus, a supplement designed to improve mental clarity and focus in the long and short-term, with the help of adaptogens and natural nootropics (clinically-tested cognitive enhancers). My bedroom is very, very dark! My partner was a professional rugby player and his coach always said that you only get proper rest in total darkness. It’s very big, and my favorite thing about it is our French Bulldog, Lola who sleeps with us. I know it’s the worst thing to let your dog do, but once they’ve done it, you can’t kick them out! Consistently at 6:30 a.m., even on the weekend, unfortunately. I’m actually quite strict about this. I aim for eight hours a night. I’m fine with the occasional night having less, but after a few, it does catch up with me. Our Sleep Drops and Magnesium Ease are my nightly staples. The duo guarantees I will wake up feeling restored and refreshed. I also love an eye mask (remember, the darker the room, the better!). I have a nice silk one from Lunya. I truly love my first coffee of the day, but I always force myself to drink a massive glass of warm water first. I limit myself to one, sometimes two coffees, but never after midday. I’m a big believer in listening to your body and eating intuitively, and mostly that means no breakfast for me as I’m not usually hungry in the morning. But sometimes your body tells you that you need a croissant and you have to listen to that craving. I used to work out religiously every morning, but in the last 18 months, I just haven’t had the time to make it to the gym. It changes quite regularly. Right now, I’m using the Pai Camellia and Rose Cleanser and then the Joanna Vargas Rescue Serum mixed with our Topical-C. I just got a new Chanel foundation which I love. It’s called Vitalumiere and leaves my skin glowing. Honestly, it’s usually quite dirty! I am a slave to dry shampoo. A huge portion of our legal and finance team are based in the U.K., so the first thing I look at are my emails to get up to speed on what’s happened during their morning. I’m usually in the office by 7:45 a.m. That first hour is always my most productive of the day.